New Member Introductions Are you new to the site? Why not start a new thread introducing yourself here. Tell us a bit about yourself, your ride and any hobbies you may be interested in. Don't just lurk, participate! To start a thread, simply Click Here! What up everybody? 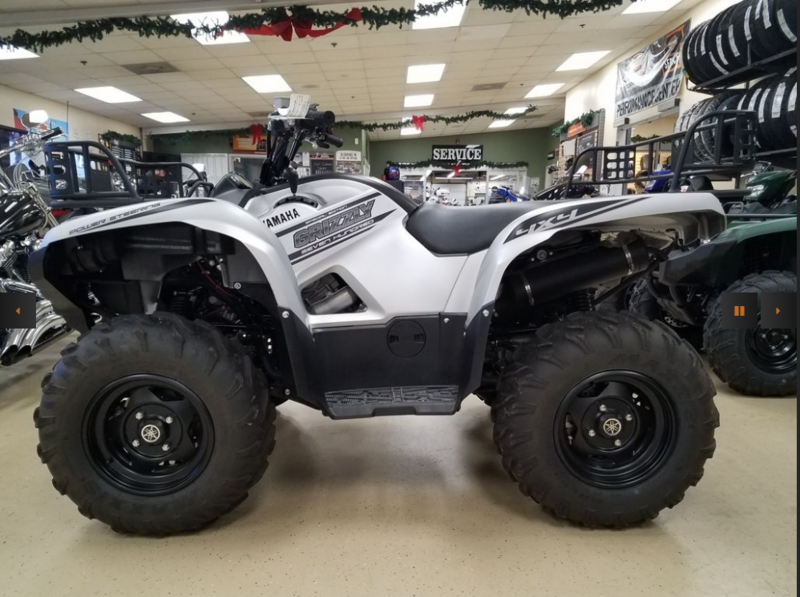 My name is Alex and I just bought a brand new 2015 Yamaha Grizzly 700 SE at my local dealership 4/1/2019 I got a great deal on it and they threw in a bunch of accessories. I'm really enjoying riding it. I do have a few questions like what fuel type I should be putting in. I recently moved to Iowa from South Florida and my local town only sells 87 with ethanol, 87 with out ethanol and diesel. The next town over sells premium but it's 91 and not 93.The 91 does contain ethanol. I went filled a couple gas cans with the 91 option but I'm curious as to if I'm going about this in the right direction. I have been riding it 2 weeks in my local town since its legal here and have accumulated 130 miles and 14 hours. I know I have to take in for servicing at either 200 miles or 20 hours which ever I reach first. Thank you for any and all feedback in advance and if any local Iowans want to meet up and hit some trails together I'd be up for it as don't know anybody with a quad. Any advice on first upgrades would be appreciated as well. Nice machine! Welcome to the forum. I'm new here myself, and first four-wheeler as well. I'm sure the pros will be along shortly, but my opinion, for what it's worth, is the highest octane you can find, and no ethanol. If you have a marina, they may sell ethanol free fuel for watercraft, if you can't find it elsewhere. An unemployed Jester, is nobody's fool. Welcome 2 GC, 87 non ethanol would be my choice. Welcome and yep, 87 non-ethanol. No need for higher octane fuel on these Grizzly bikes. And if you ever make your way out to high altitude, the octane drops to 85 instead of 87. Thank you for the feedback gentleman. So I will go with 87 non ethanol. Any tips on the first upgrades I should do? That is a very nice looking Grizz. Welcome to GC from Maine. Check mine and others signatures for what we have done for mods. The ones that have made the biggest impact for me are the good radial tires, the windshield, clutch mods, and the luggage. Have fun! These are low compression engine so do not need high octane. New? just out of the crate? or dealer demo? You conditions will determine the order of mods. I use a winch a lot, and the taller tires are better than the stock tires. Oh, and I would not let the dealer part changers touch my grizz ever. I suggest doing the service yourself. You have G.C. for questions when needed. Fast Green Convertible "06" 660 on 26" BH OG's with Stock Wheels. 21 gram weights, weight covers reduced to 29 mm diameter and a 2 mm Cut Cam Plate. Grab Strap, Cooling System Up-Grade and multiple position mirrors. Welcome to GC from Tn. and nice looking Grizz congrats. 87 non Ethanol for sure. If I bought a new Grizzly I would start with tires , clutch , light bar if you night ride , and I love to listen to music so a radio is a must for me. Post some pics of your mods as you go and how you like them. Just so you know once you get bit by the mod bug it's dangerous for the wallet! If you're looking for non-ethanol fuel, try here: www.pure-gas.org. Nice bike, good luck with your fuel, and for the first mod most get new tires and maybe wheels, just have fun with it and make it your own! Like @Ridgeway 81432 replied try to do your own maintenance, get a Survice manual for yourself and if questions arise many here can help. 2016 Green Grizzly,708cc, FI, EPS. Shift lock cable, removed.— AIS - blocked. Yamaha, glide plate.— ODI, Rogue grips. Maier, hand guards.— handlebar end mirror. Battery tender Jr.— Voltmeter & USB ports. Yukon Outfitters, Tactical Bug Out Bag. Bunker Hill, ammo cans, two. Tiger Tail, tow Sys.— Boss 600w sound sys. Superwinch,Terra 3500.— 2R exhaust tip. Grenade shiftier knob.— EHS, air box mod. EHS,fuel controller.— EHS, air box lid. K&N, air filter.— Coops 45 mod #3. EPI, purple spring.— .5mm shim. 26” Big Horn tires. — ITP Delta rims. Rotopax, 1 gal. fuel.— Kidde, fire Extinguisher. Garmin, etrex gps on Ram mount. Congrats on the new ride @13Bravo ! Glad you bought that machine. I've been eying that one on Craigslist for months thinking maybe I should get rid of my 2012 and pick up that sweet looking 2015. As far as gas goes, 87 non-ethanol is the best in my opinion. STI wheels - 27" CST Clincher tires - Superwinch Terra 4500 Syn. Today 08:46 PM by Greeng0!